← Less than 1 week – Healthcare Estates Conference & Exhibition 2017 – Come and see us on stand E23! 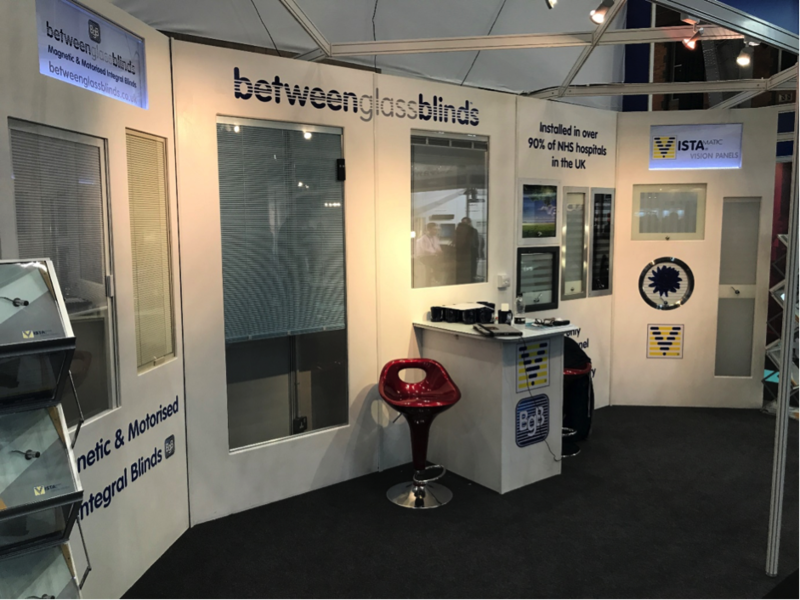 Between Glass Blinds and sister company Vistamatic occupied stand (E23) at Healthcare Estates earlier this month and once again it was a hive of activity. We enjoyed catching up with old and new faces over the course of the two-day conference and exhibition and look forward to seeing you again soon. Between Glass Blinds showcased some of their manual and motorised integral blind solutions which got a lot of stand visitor’s attention. BGB’s blinds are available in either a Venetian or pleated style, which sit inside a hermetically sealed double glazed argon filled unit, eliminating the accumulation of dust, dirt & debris and provide light control and a high level of privacy, optimised hygiene, excellent acoustic insulation, cord-free anti-ligature safety and they require no maintenance, making them perfect for healthcare environments as either an internal or external privacy and observation solution. The Vistamatic vision panels also went down a treat with the visitors and other exhibitors over the course of the show Vistamatic triple-glazed, privacy vision panels are suitable for all healthcare and clinical environments. Vistamatic vision panels offer a combination of high integrity glazing, incorporating a stainless steel frame and anti-ligature device and featuring the VistaGlide™ IAS (Impact Absorption System), providing silent operation. Vistamatic also offer a wide choice of over 100 shades of colour, or sandblast effects, all of which can help add a unique identity to any project, creating an exciting or calming influence within an environment. In addition to this, Vistamatic has the ability to incorporate individual bespoke graphics that can transform the aesthetics of an environment whilst maintaining the observation merits of the panel by incorporating individual bespoke graphics. The popular Life-Line Key Lock, the gated key system designed to limit the potential a service user has to block a key-way in an attempt to prevent clinical staff from operating the locks in a secure environment also was a hit with the exhibition’s vistors. The Life-Line key can be used for many different applications – Vistamatic privacy observation panels, door locks, window locks, cam-locks and ancillary bolts to name just a few! All these locking products can now be operated by the same key making life more convenient for the carer while at the same time creating a much safer living environment for the patient.